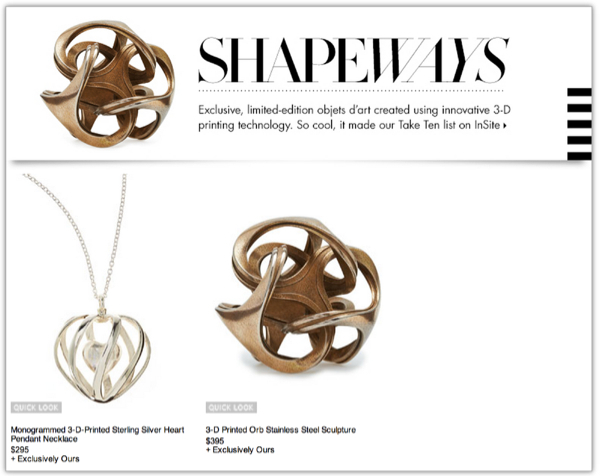 Shapeways Jewelry Pieces in Luxury Specialty Department Store Neiman Marcus #3DThursday #3DPrinting « Adafruit Industries – Makers, hackers, artists, designers and engineers! This limited edition 3-D printed orb is made from a fluid shape brought to life by Shapeways 3D Printing. More than just an object—it’s a work of art; a mathematical symmetry expressed in stainless steel. Exclusively ours; designed by Bathsheba Grossman. Fluid shape cast in 3-D printed stainless steel. 3″H x 3″W x 3″D.